Running like a girl has taken on new meaning in light of the recent World Cup victory of the U.S. Women’s Soccer team. Although it was launched a year ago, Always’ “Like a girl” campaign is more relevant than ever today. P&G-owned Always feminine products’ research found that girls’ confidence begins to erode at puberty. The campaign is designed to change the mindset that the phrase “like a girl” is somehow substandard. “Do we limit girls and tell them what they should or shouldn’t be? Do we box them into expected roles? 72% of girls DO feel society limits them — especially during puberty — a time when their confidence totally plummets. Always is on an epic battle to keep confidence high during puberty & beyond. The campaign was developed by “choosing an idea that felt insightful, relevant and true. 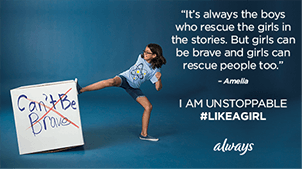 #LikeAGirl had it all and in a few words, could capture people’s attention and imagination. Next, we decided that a social experiment was the best way to bring this idea to life,” according to Leo Burnett’s John. Initially, social media played an important part in getting the campaign to the masses with over 55 million YouTube views; 200,000 YouTube Likes; 150,000 Facebook comments; 350,00 Facebook shares; and 40,000 Tweets. The campaign expanded its reach even further when this one-minute spot ran in this year’s Super Bowl. The brand says its video is doing more than just rallying supporters for equality. Always commissioned a study of the ad and says that 76 percent of young women ages 16 to 24 said they no longer saw “like a girl” as an insult after watching the ad. Two out of three men who watched it said they would think twice before using the phrase as an insult, according to the study. The newest iteration of the campaign asks both girls and grown women whether they’ve ever felt prevented from doing something because they are a girl. The answers are just as revealing as those in #LikeaGirl: from the little girl who poignantly says “It’s always the boys who rescue the girls in the stories” to the older women talking about how they changed when they reached puberty. The interviews are interspersed with statistics from an Always survey, such as that 72% of girls think society limits them. The spot introduces a new hashtag, #Unstoppable, asking girls to share their stories online. Market the mission: instead of hyping your company’s product attributes, focus on the mission as Always does with its girl-empowering message. Target your audience’s causes: Fifty-four percent of Americans made a purchase decision associated with a cause in 2013, according to Cone Communications. Millennials in particular care about cause-related marketing. Keep the commitment: commit to a cause that supports your values on a long-term basis. Humanize it: GE Health Services focuses their marketing less on the product and more on the human experience of how they help patients and families. Give back: My company, New Moon Marketing Communications, gives 5% of our profits to five causes near-and-dear to my heart. If someone refers a client we’ll up the donation to 10%. Can you define your purpose?